Note: Change colors after each round or as to achieve your desired look. Ch 36 (or number needed to go around your jar). Row 1: Work 1 sc in 2nd chain from hook and each ch across, turn — 35 sts. Row 2: Ch 1 (does not count as st), work 1 sc in each ch across, turn — 35 sts. Rows 3 through 17: Rep Row 2 through Row 17 or until piece is tall enough to cover the height of the jar. Row 18: Ch 1, work 1 rev sc in each stitch back across row just worked — 35 sts. Fasten off leaving a tail of about 10 in. Using a tapestry needle and the tail, sew pieces around mason jar. Weave in ends. Round 1: Ch 1, *work 1 sc in ring, ch 3, repeat from * 4 more times, join — 5 ch-3 loop petals. Fasten off leaving a long enough tail to sew flower to mason jar cover. Pull out your stitch dictionary and start picking some fun stitches to work up the rest. This is a great opportunity to learn some new stitches or practice some others that you are trying to perfect. 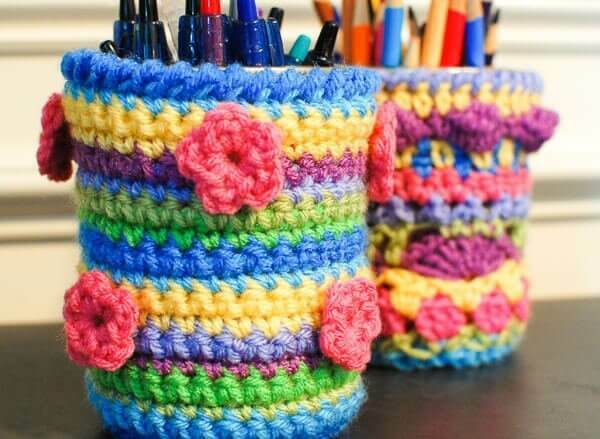 These cozies make me want to learn to crochet. They are ideal for gifts etc. Thank you! I enjoy the cozies you have posted, they’re very creative! I was wondering if you have come across or created a jar cozy pattern with chevrons? Instead of mason jars, I will use my dishwasher cleaned empty dog food cans. I am going to make these, but instead of the mason jars, I am going to use dishwasher cleaned empty dog food cans. 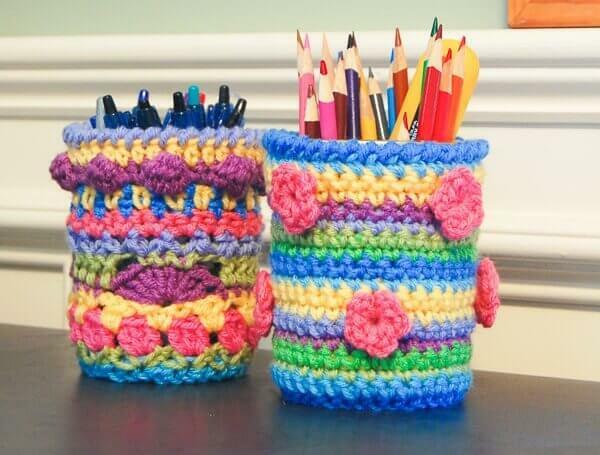 I would like to know where the pattern is for the other mason jar crochet cozy in the picture? I like the one with all the different stitches. It is not there when I click on the pattern. I Love Your Blog!! You have a great talent for crochet design & thank you for sharing it. Can’t wait to make this jar cozy! I’m feeling the winter blahs myself & the bright “spring” colors on your cozies helped me remember spring is on its way (sooner or later, lol). It will make a good Easter gift for some of my coworkers. Thanks again for sharing & happy crocheting!! Wow, these are so fun! I love these springy colors here in the dead of winter! Well done, Kara! The color scheme in this project is lovely! Love this so much,. thank you!!! Thank you for solving my dilemma over what to do with the wide-mouth jam jar whose ring-and-cap cover was finally too rusted to keep. Wonderful happy colors for a blah winter’s day! Just what I needed to see. Very cute Kara, thank you! Hi Linda 🙂 it is just a single crochet worked in the opposite direction as you usually work, although it can be a little awkward to do at first. Perhaps check to see I there is a how to video on YouTube. very cute ,Thank you for lovely pattern . I’m new to your blog. I’ve been lurking for about 2-weeks now. I wanted to let you know how much I am enjoying your blog and your lovely patterns. I’ve already printed off a few patterns that I want to try. I’m self-taught and not experienced with reading patterns. I can, however, understand most yours! Thank you for creating, presenting and sharing such lovely patterns. I look forward to hearing from you about the circle tutorial. Hi Bobbie 🙂 I’m so glad you are enjoying my patterns and blog! I don’t have a tutorial for working in the round per se, but you should be able to do it just by following a pattern that is worked that way. I do have a tutorial for making a magic ring that may be a help though. It is under my Crochet Tutorials tab at the top of my page. Hope that helps! My daughter saw the mason jars and said “please Mom I have to have that jar ,PLEASE, PLEASE!! Of course I told her -yes. As I too am a mason jar fan!! !